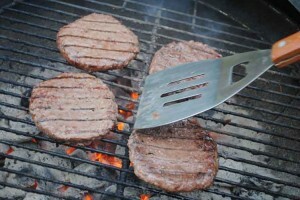 In years past, I’ve never been a huge fan of the grill. 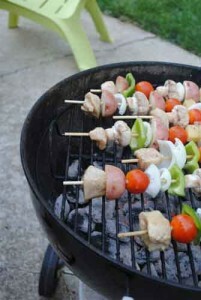 A turkey burger here or a grilled chicken breast there, but grilling was never something I got, like, psyched about. But then I started grilling veggies, fruits, different kinds of sausages from Trader Joe’s—and pairing them with wine—and then it was pretty much over. 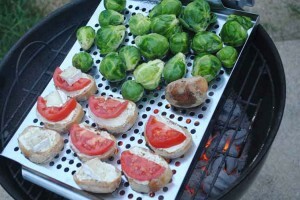 My fascination with healthy grilling was on. You can just be so dang creative! 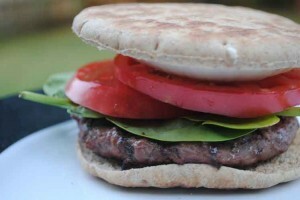 With the summer grilling season wrapping up, I thought I’d share a few of my recent grilling endeavors. 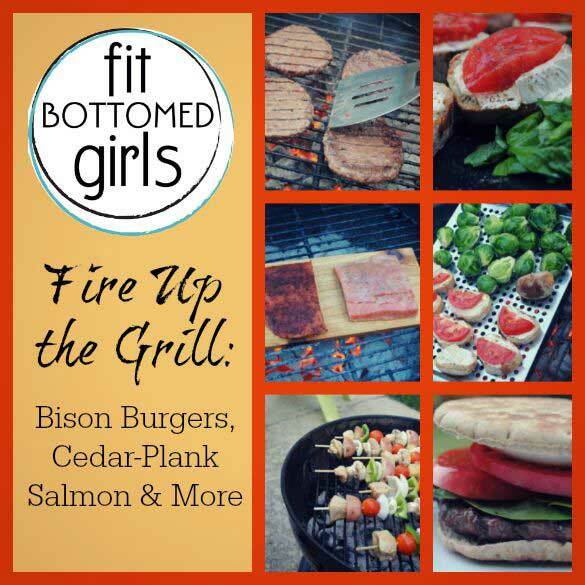 They just might give you a few good healthy grilling ideas for you to mix things up this weekend! 2. Chicken kabobs. For these, I chopped up some green pepper, onion, potatoes (boiled them until they were just tender), pineapple and chicken (which I marinated in some Asian sesame dressing), and skewered (one of my favorite words, ever, by the way) them with some mushrooms and cherry tomatoes. Simple, filling, healthy—just what a meal should be. 3. Bruschetta (or something like it). Just a few weeks ago, I invested in a grilling tray, and it’s opened my grilling world up. On a lazy Sunday, my hubs and I grilled up some tasty Brussels sprouts (cannot get enough Brussels sprouts in my life) seasoned with olive oil, salt and pepper, along with my version of bruschetta. 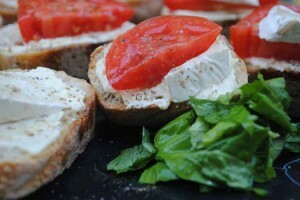 “My version” pretty much includes whatever cheese we have in the fridge (in this case, it’s brie and goat cheese), fresh tomato and basil from my herb garden topped on small slices of whole-grain baguette from Trader Joe’s. It’s simple, but it’s heaven. Filling enough for a vegetarian meal, too. 4. Anything on a cedar plank. Ready for the big ta-da? 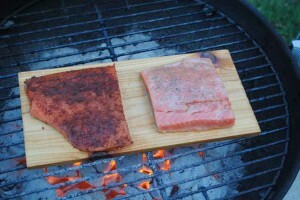 I made two kinds of cedar-plank salmon. On the left, a cajun-spiced piece of salmon (I used Slap Ya Mama cajun spice blend, which I’m pretty sure is the best name for anything ever), and, on the left, an Asian-inspired one that was seasoned with soy sauce, rice vinegar and ginger. Grilling the salmon on a soaked cedar plank (no forest fires here, guys), gives the salmon a smokier and more woodsy flavor than usual. That sounds super foodie, but just trust me. It’s fantastic. I love bison/buffalo and recently discovered it again this year. My husband is a big venison eater and I think it tastes too gamey for me. I switched back to beef, but I thought that had a weird taste after eating venison. I decided to try Bison once more and found a happy medium that’s healthier than beef without an aftertaste. Yay Bison! We just grilled salmon on a ceder plank the other night. The store had a fantastic sale on some bright-red, delicious looking salmon so we picked up a fillet, some brown rice, and some asparagus. We were a little indulgent in our preparation–I threw some chopped shallots and garlic into a generous pat of butter on the stove, added some salt, pepper, lemon juice and dried dill and simmered long enough for all the tastes to blend. Then we brushed that all over both the salmon and the asparagus on the grill. It was heaven for my tastebuds. I’m having the left overs for lunch today and can’t wait to gobble it up!